Outs: Saints: Fisher (toe), Hartley (suspended), Fotuali’i (shoulder). Tom’s preview: Some clubs will look at the new year as a fresh start. They will look at the calendar and hope that the next 12 months will see them turn a corner. They will be desperate for a change of fortunes, hoping new year’s resolutions come to fruition. But Saints will merely be hoping it is a case of as you were. They won’t want the new year to bring change. They will simply want to continue on the 2014 path because the past 12 months have brought a huge amount of success. A total of 36 games were played by Jim Mallinder’s men in 2014. They won 28 of them, drawing one and losing just seven times. Oh, and they won two trophies - the Amlin Challenge Cup and, most importantly, their first Aviva Premiership title. It was a magical 12 months that will live long in the memory of everyone at Franklin’s Gardens. But the message is that a fresh calendar must bring fresh motivation rather than a feeling of reflection. Listen to the players and coaches and 2014 is now in the past. It is the present that matters, starting with Newcastle Falcons at Franklin’s Gardens on Friday night. In truth, whether it is January 2 or December 2, it should make no real difference. 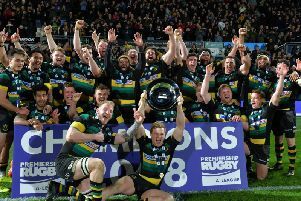 For Saints, it is just another chance to display their impressive development under Mallinder and Co.
Another chance to get the Franklin’s Gardens faithful, who have witnessed a stunning 43 tries in eight games this season, off their feet. And it is the chance to continue the good form rather than start something new. Last year was very much the year of the Saint. This year, they will hope that it is the year of the groundhog.